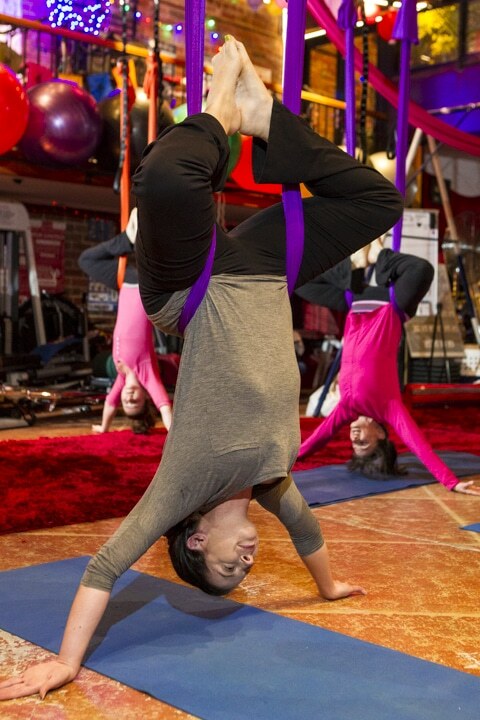 Antigravity yoga immersion & the benefits: You will leave the class feeling lighter refreshed and renewed. Your posture will be improved and you will be taller (growth is not cumulative). There are so many benefits and even through mindful consciousness, learning new skills, creative and artistic fitness experience, muscular release through self-massage techniques, realigning of the spine, decompression and hydration of the vertebral discs within the spinal column, which also allows space for nerves within the spinal cord, refreshes the lymphatic, digestive and circulatory systems and release “happy hormones”. We will take you on a journey into re-aligning, lengthening the spine and self-healing. We guide you on the ancient healing aspects of meditation, breathing and mindful breath. Connecting your inner awareness to the physical benefits of the anti-gravity yoga hammock. Your heart will open stretching and lengthen your whole body and spine with laughter, vivid expression. Beneficial for everyone that wants change in their body shape and life.